The historic Grove House Entertainment Complex at 11 Grove St. off Patton Avenue in downtown Asheville has been sold to Ohio-based real estate investors global X for $2.9 million. Former owners Jeff and Sherrie Davis, who bought the property 12 years ago, will continue to operate Grove House Entertainment in the space, which includes Scandals Nightclub, Club Eleven and The Boiler Room, according to Jeff Davis. The new owners plan to renovate portions of the property over time, possibly adding uses such as a restaurant or a brewery, Davis says. The first project on the investors’ list is suspending a transparent floor over the building’s indoor swimming pool to create an unusual event venue, he adds. The entire rambling structure encompasses just over 20,000 square feet of space. 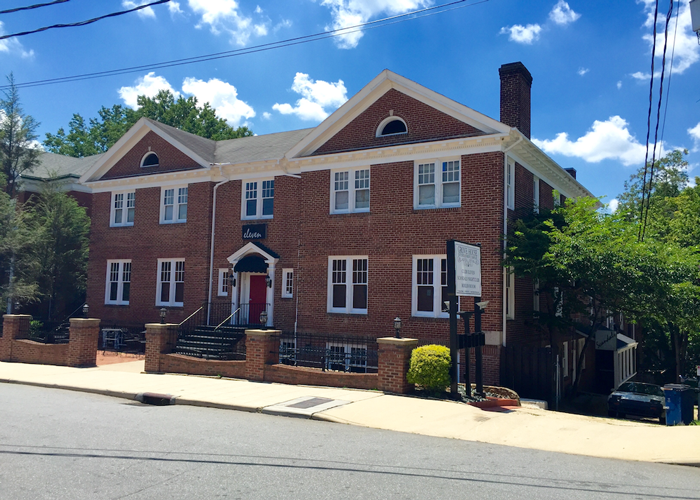 Built in 1924 to serve as the city’s first YWCA, the facility was one of the first to host racially integrated crowds at events such as Eleanor Roosevelt’s 1956 visit to Asheville. “I have never needed the whole space,” Davis says. “Much of the building sits empty most of the week.” He believes adding complementary businesses to the complex will benefit the night clubs he operates there on Friday and Saturday nights. His lease runs through January 2019, at which point the new owners’ plans for the property will affect what spaces will be available for Grove House Entertainment’s use. According to global X’s website, “global X operates investment funds to provide equity for the acquisition and development of historic real estate.” The company owns at least one other property in Asheville, along with buildings in Columbus and Cleveland, Ohio; Columbia, S.C.; and New Orleans, La. Davis points out that he is hoping to sell the entertainment company as well. “We never planned on owning it this long,” he says, and aging parents mean he needs to cut back on some of his business activities. “If somebody would like to take over the business, we’d do it as an asset sale and then help them get it all going,” he explains. While some people think the Asheville market has reached its peak, Davis doesn’t see it that way. “There’s so much money that is parked here now,” he says. When the developers who have stashed money in Asheville real estate for tax purposes get around to realizing their planned projects, “We’re going to see a lot more cranes in Asheville,” he predicts. But the most important thing to Davis is that the property continue to promote entertainment opportunities for the whole community. “It’s never been about the money to me,” he says. Speaking of the transition of the entertainment company to new ownership, Davis says, “I want to see this survive, so I’m going to stick it out for as long as it takes.” Scandals Nightclub, he says, was founded 36 years ago by Art Fryar, the building’s previous owner. SVN Blackstream Real Estate was the broker for the sale.